Get in touch with your creative side during this 10-hour, in-depth, private group exploration of the life and work of Spanish artist Salvador Dalí. Discover Dalí’s childhood home and early years in Figueres, before exploring the city’s Dalí-designed Surrealist Museum. Then check out Pubol, home to the Gala Dalí Castle where the artist and his wife once lived. Learn about the early years of this Spanish genius in Figueres, walking the streets and hangout spots where the young Dalí himself once roamed. You’ll also pay a visit to the Dalí Museum, an institution designed by the Spanish creative inside the shell of a former municipal theater. 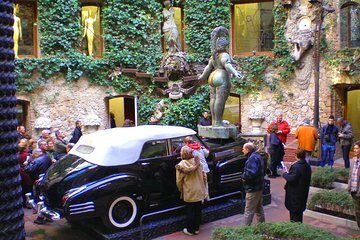 The site offers one of the world’s best collections of Dalí artwork, offering a great look at his creative output. Continue from Figureres to Pubol, home to the Gala Dalí Casa. Making up the third point in the “Dalí Triangle,” this residence was once the home of Dalí and his wife Gala. A mausoleum inside this medieval building also houses Gala’s remains. At the end of your visit to Pubol, receive a transfer back to Barcelona and a drop-off at your hotel.